Hot Start Polymerase with ultra short inactivation time, free of MAB´s. 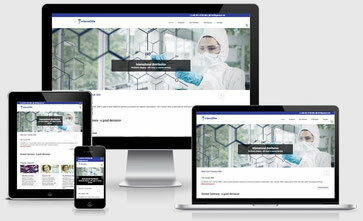 The glycerol-free version is designed for Lyophilization, especially. Maximo H-SPlus Taq DNA Polymerase (recombinant from Thermus aquaticus) catalyzes the polymerization of nucleotides into duplex DNA in 5'→3' direction in the presence of magnesium. It also possesses a 5'→3' polymerization-dependent exonuclease replacement activity but lacks a 3'→5' exonuclease activity. The activation of the enzyme starts immediately at 70°C and requires no increased time in heating or denaturation step. Its activity is blocked at ambient temperature and switched on automatically at the onset of the initial denaturation. 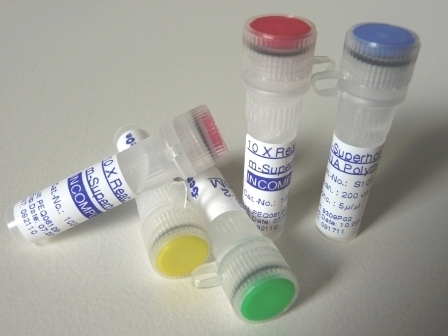 The thermal activation prevents theextension of nonspecifically annealed primers and primer-dimer formation at low temperatures during PCR setup. One unit is defined as the amount of enzyme required to incorporate 10 nmoles of dNTP into acid-insoluble material in 30 min at 72°C. 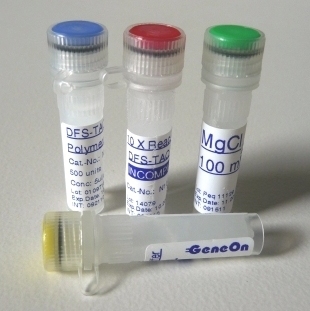 GENEON OFFERS A GLYCEROL-free HS-Taq Polymerase. Please ask for product Code S410-GF. - H-SPlus Taq DNA Polymerase is free from endonucleases and primer contamination, positive PCR performance with several templates of Lambda DNA (<= 12 kb) and human placenta DNA (3kb). H-SPLUS Taq DNA Polymerase "Hot-Start"